Hi there – thanks for reading about the Kotahi Groove Band. While riding around Narrabeen Lake, my son Sam and I were struck by some awesome bass grooves thumping across the water. There was clearly a special band playing at the Narrabeen Lakes Festival. We rode around to see them. So here I am! It’s a privilege to play with Kotahi Groove. I have front row access to the harmonies, guitars and cracking rhythm section. A groove-based rock band with a unique approach to its repertoire setting it apart from other bands – old-school RnB, soul and funk and some cool iTunes hits. Such a large and changing repertoire – I’m enjoying putting together horn, organ and keyboard arrangements – I hope to keep improving my musicianship. 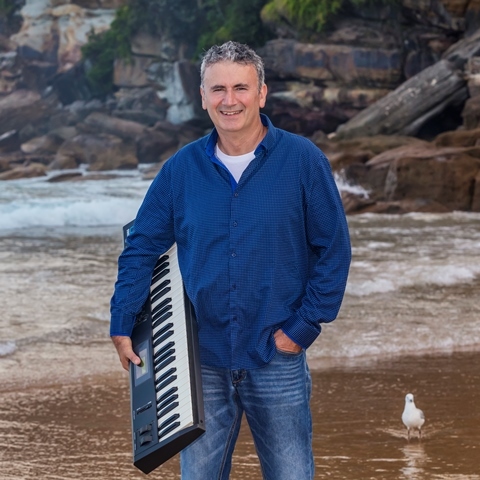 In the 80s I was part of XPT, an impressive and successful cover band show playing great venues in Sydney, Wollongong and Newcastle, and some memorable country / B&S Ball tours. In more recent years, prior to joining Kotahi Groove, I played with the talented gents from northern beaches bands the Rockafellas and Rockfish. Do you need to get your groove on? Get a group together and come along to a Kotahi Groove gig – go to Facebook for venues and dates. See you at a gig.